Going with all Japanese articles for today’s bullet points, since I haven’t really read anything in English for the last couple of days. A Japanese blogger has set up a site to protest Senichi Hoshino’s prospective involvement in next year’s World Baseball Classic. The movement seems to be spreading, as banners like this and this are beginning to appear elsewhere in the Japanese blogoshpere. Update: The campaign won’t have to continue on very long as Hoshino has already said he won’t accept the job if it’s offered. The Hiroshima Carp will be be wearing throwback uniforms from the team’s late 70’s/early 80’s golden age. 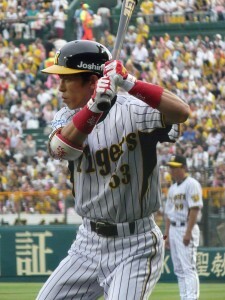 Carp Blog has a pic and good graphics in general. Chunichi Dragons blog Negative Dragons reported that 2nd baseman Masahiro Araki will not excercise his right to become a free agent and stay in Nagoya. Sponichi reported the same news the following day. I’ve updated the 2009 NPB free agent list. At the risk of stoking the flames: scouts from six major league teams including the Yankees watched Yu Darvish shut down the Lions on Sept 9 (English Box Score courtesy of JapaneseBaseball.com). I guess this is what Gene Michael was doing in Japan. Sanspo re-iterated that “Darvish has not expressed any intent of going to MLB and is affectionate toward his team, but MLB teams won’t leave him alone“. Chunichi pitcher Hitoki Iwase become the first NPB closer to record four consecutive 30+ save seasons. Question for bullet points readers: do you enjoy the Japanese content or the English content more? What topics do you find most interesting? Japan is getting pounded 8-4 by America as I type this… what a disappointing Olympics for Team Hoshino. Still, Korea and Cuba asserted themselves as winning countries, so I think it’s not a bad result for the game of baseball. Let’s move on to the bullet points. I’ve got a couple stored up from the last few days. Hitoki Iwase got lit up to the tune of a 13.52 ERA in 4 2/3 innings of Olympic competition, taking 3 losses. On the plus side, his 7:1 K:BB ratio was strong. Nikkan Sports has the stats published for all the Olympic teams (Japanese only). I found a great blog entry about various NPB batters’ stances. Click the 動画 link above each image to see video highlights on YouTube. My recommendations are Sadaharu Oh and Hitoshi Taneda. Colby Lewis made his return to the Hiroshima Carp on August 21, his first start since July 1. He held Hanshin scoreless in 5 2/3 but didn’t pick up the win. Nagisa Arakaki set a new Japan record with five wild pitches in one game, including three in the fourth inning. This guy has great stuff and would dominate if he could do something about his control. Yu Darvish is heading back to Japan and scheduled to start on September 2 against Softbank. Sales of Kazuhiro Kiyohara goods are up 1000% since he announced his retirement. Unlike their male counterparts, the Japan woman’s softball team took home the gold. I’m mentioning it here because Japan starter Yukiko Ueno pitched back-to-back complete games on consecutive days in the knock-out round, and according to this article threw 413 pitches over the two days. I find that number very hard to believe, even though the semi-final was an extra-inning game. Deanna posted some excellent photos of a recent Marines-Eagles game on her blog. Richard Deitsch picks on Senichi Hoshino in his Olympics Quote of the Day.